One of my favorite food even when I was in PH. 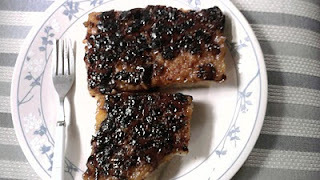 I love it especially when there is a caramelized toppings on it. This time my friend made this one because I was really craving to eat some. And since there is no occasion recently, she gladly made it too. I was really happen when she send me this share. I gave her some of my sticky sweet rice so when she's making it'll be more than what she have. Honestly, I only share some of this to my husband. Greedy of me. But I am sure his find with that because he isn't that fanatic of this more than I do. Besides, this is my morning breakfast. It is even more good when you have a coffee italia in the morning and this one too. Hmmm, your day will be perfect. If you want to get to know how to make it? Search the recipe online. And of course, make sure you find coffee that is best to go with it. never tried yet but seems delicious.... yummy looking novs!